Front row (left to right): 1. Richard Fletcher, 2. Dennis Bammer, 3. Teddy Fisher, 4. Barry Westling, 5. Dale Stewart, 6. Larry Langley, 7. Tommy Wade. Second row: 1. John ?, 2. Mary Ann Hurtt, 3. Rose Garcia, 4. Margie Reay, 5. Sue Richardson, 6. Sandy Marsh, 7. Janice Evans, 8. Miss Johnson. Third row: 1. Monte Ferrario, 2. Dean Preftokis, 3. Kathy Bireley, 4. Dorothy Tyers, 5. Christy Bachman, 6. Bobby Ray. Fourth row: 1. Karl Bernard, 2. Bart Schenone, 3. Steve Nordahl, 4. Douglas Nakken, 5. Bobby Parr, 6. Kent Yarborough, 7. Sammy Jackson. Credits: From the collection of Margie (Reay) Kiser. Scanned by Brian McFann. 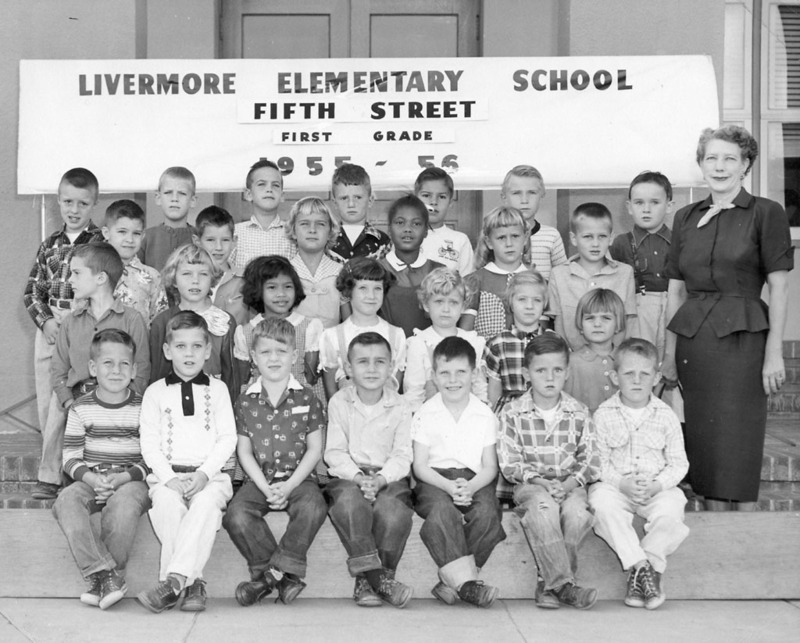 Original photograph by David's Studio, 1065 First Street, Livermore.